What do you know—eight months later and I've finally remembered to update this thing. I'm sorry for the two followers that followed me expecting updates... College for the most part is extremely time consuming, and I haven't been allowed to really jot down my baking adventures. Not that I have a lot when I'm in college anyway. Well, that's not entirely it. Part of it is because I get super lazy when it comes to blogging, and I got into a cooking/baking slump towards the beginning of my spring semester in college. That semester was full of Chiptole and other sorts of fast foods that I don't want to recall. But now it's summer, and I've decided to at give this another go. Currently, I'm in Hong Kong, the home of good foods and where everything is tasty and nothing hurts. (Just kidding, everything hurts because it's either stir-fried or deep-fried. Agony.) Regardless, expect posts related to Hong Kong food and Asian cuisine in general! While I might not be blogging about my own food, maybe you'll be interested in the food that I've been trying out here...? Maybe? Here's hoping! I'll also probably post a couple of bread/baking recipes that I've done since the last time I updated. My memory's a bit fuzzy on some of the things, but if anything, it might still be good for reference or something! In any case, to make this entry at least a little bit relevant, here's a quick and easy dessert recipe. Giga pudding! My roommate and I made this the day before summer break started. We originally planned on making macarons, but due to lack of time and coordination and general procrastination, we decided to throw something together quickly so that we guaranteed ourselves a dessert at the end of the day, haha. For those who don't know, Giga Pudding originated from this Japanese commercial, selling...well... a bucket-sized pudding. Well they call it pudding, but you know, it looks like flan to me. (I still refer to it as pudding though, too...) And seeing as we can't buy jumbo-sized pudding here, my roommate and I took it upon ourselves to make our own. Open the caramel sauce packet and pour it into a large bowl. Set aside. Pour milk into a large pot, and add in the flan mixture. Stir until smooth. Stir frequently, and turn off the heat when it comes to a boil. Pour the milk/flan mixture into the large bowl. Let cool. Store in refrigerator for 2-4 hours, or until firm to the touch. When firm, use a plastic knife to go around the outside of the pudding to loosen it up. Grab a large plate, and flip the pudding onto it! Jiggle your giant pudding in satisfaction. It didn't come out as big as the Japanese giga pudding, but if we had used 3 packets of flan mix, we wouldn't have been able to pour all of it into one container. My rice pot simply isn't big enough—it fits exactly two quarts! Our giga pudding came out very syrupy too, because we used a lot of caramel sauce, but if you want it less sweet/less brown/less caramely, just eyeball it and see how much sauce you want to put. 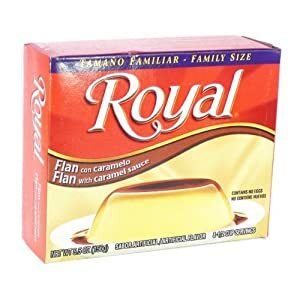 Our pudding resulted in something that was rich, smooth, and very fun to eat—we were surprised because we had such good results, despite it being box flan. And we had a lot of fun sharing it with our friends...no one could stop jiggling the pudding around, so we made a mess. And just as a side note: The instructions say to add egg or use a richer (larger fat %) milk if you want a richer flan, but we used 2% skim milk without any eggs and it still worked out rich enough for us!